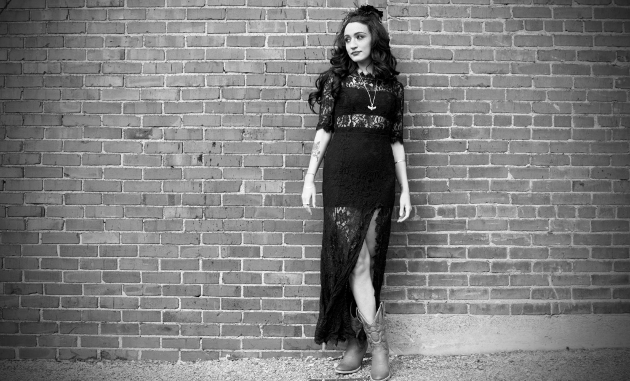 Lindi Ortega is no stranger to the dark regions of the mind, or the mortality that hangs over all of us like an ever-present nightmare, just waiting to swoop down and become our fateful reality. As a student of the folk rituals surrounding Día de Muertos through her half-Mexican heritage, her funeral veil, her ghostly pale skin contrasting with the ravenesque waterfall of black curls, it all seems to infer Lindi’s flirtatious notions with the fragility of life. No wonder Lindi finds herself resigned to constantly evaluating her own fate as the crawl of time creates more obstacles than opportunities to fulfilling one’s purpose on this moral coil. Over the last few years, the music of Lindi Ortega has shifted from stories of the recklessness of youth and a wondrous fascination with death, to themes on the realities of life where career pressures and one’s own age hound you incessantly, and can feel like ticking time bombs. Lindi Ortega is very much a refugee of the wrongful path that country music and Nashville have made recently, relegating women to second-class citizens and leaving so few slots for sustainable success. Songs like the title track to her 2013 album Tin Star, and a few of the selections on 2015’s Faded Gloryville found Lindi lamenting the fact that benchmarks of ascendancy had alluded her, even if she had seen what looked on the surface as significant acceptance in Americana, and by the Canadian Country Music Awards in her home country. Though nice accolades, and even significant in moments, these things never resulted in the upgrades from renter to owner, or from critical-darling to commercial prosperity in Lindi Ortega’s career. And so she’s decided to go back home, and pondered nearly quitting the music business altogether. There is a reason most EP’s get relegated to the “also-ran” section of an artist’s biography. They’re usually half efforts, stop gaps, primers, or collection places for oddball tracks left off the tail end of other projects. Though some artists get enchanted with the notion of more short-form releases for their creative output, EP’s are hindered from the very start from finding the proper attention their music may deserve. 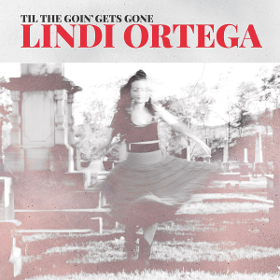 But with Lindi Ortega’s Til The Goin’ Gets Gone, the idea to go EP is just about perfect. Go longer, and the mood that Lindi captures for the time and places she’s in at the moment would have risk getting diluted. Wait for the next project to come along and put these songs on it, and perhaps the emotional potions that inspired these compositions and performances would not be as potent. Til The Goin’ Gets Gone is like an exhalation from Ortega’s time in Nashville, and an honest take about the dark head space she found herself in when she nearly decided to walk away from it all. We probably don’t need yet another cover of Townes Van Zandt’s “Waitin’ ‘Round To Die.” I remember having that discussion around Whitey Morgan’s last album. Nonetheless, it fits here, and Lindi’s performance begs the track to be heard, and in collaboration with this EP’s other tracks. If there is an oddball here, maybe it’s “What A Girl’s Gotta Do,” though between the lines Lindi seems to be shaming the scenario that finds so many young women having to compromise themselves to make it in the modern world, almost as a way to highlight how she never decided to take the easy road with her music, and paid the price. Both these tracks are very nice, but it’s the title track, and “Final Bow” that make this EP so much more valuable than a comparably-price value meal at Jack in the Box. “Til The Goin’ Gets Gone” finds Lindi assuring herself of the path she has chosen, and that sometimes you just have to focus on the next step ahead instead of past failures or second-guessing. The real gem is the incredibly-heartbreaking and dark “Final Bow,” challenging even the most heart-wrenching moments of the Tom Waits canon in the way Lindi makes the piano keys bleed and weep behind the mourning of Lindi’s ultimate moment of self-doubt. Many more albums will be released in 2017 that required much more effort to produce than Til The Goin’ Gets Gone. It’s is a sparse, four song affair recorded in parts in a bathroom and rushed to market to coincide with Ortega’s exit back to Canada. But it also does what every great piece of art requires—whether it’s a photo, sculpture, painting, film, or audio recording. It captures the bubbling up of an emotion-filled moment that one never wants to forget, even if the pain is unbearable, because it reminds one they’re still alive. She reminds me of a young Dolly Parton. The sadness of the mountains, the beauty of the sigh. Saw her in London, ON (Canada) as the opener for Chris Stapleton…. What an incredible voice! After her act she went to the merch table to sign autographs and chat to the fans. Just an overall amazing experience. Who needs Nashville, when you have the Great White North!? It always struck me as strange that Lindi would choose Nashville as her residence. Her music just didn’t seem to belong there as well as the Nashville industry’s – to be nice – aversion to women. This latest release brings hope to this long time fan that her music will continue and that her return to Canada will bring her fans many new songs. Nashville is also the home for Americana and the independent roots industry. It makes some sense for her to move there. What doesn’t make any sense is for her to be ignored. It could still be that Nashville has a hard time wrapping their minds around someone who was born in Canada but has a Mexican surname and a background to match, plus a musical style that runs the gamut from 1950s rockabilly to the Bakersfield Sound of the 1960s and the California country-rock movement of the 1970s. They don’t seem to be able to handle someone who is so radically different–and Lindi IS different, no question about it (IMHO). Or they just don’t know really good music. I’d consider this song great. It echoes in me long after I’ve listened to it. True. Sometimes, there’s just no accounting for taste…or lack thereof. Thanks, just purchased it. For those buying through Amazon, the download of the entire EP wasn’t working, but purchasing each song individually worked fine. Dynamite voice. Fantastic live performer. People need to see her in concert- she brings chills when she sings. Incredible tune, even on first listen. Thank you for the excellent review! These people give up so much, and the vast majority don’t get much at all in exchange. Maybe worst of all, you often see/hear them performing the music they’ve sacrificed for, in places full of people eating, drinking ,talking, and ignoring them. It’s a beautiful mournful tune. ….I’d give that comment 1,000 likes, if I could. Can’t tell you how many times I’ve seen this happen. I Live in Canada, have Canadian Itunes account, can not buy it on my Canadian itunes account. American Itunes will not let me buy it, cause I have a Canadian account. Most beautiful voice in country/americana hands down. I hope she sticks with it. I saw her open for Stapleton in Calgary (her now hometown!) a couple weeks ago. Her voice sounded just like her recordings, if not better AND she was fighting a cold. Her and her husband were hanging out at the merch table after the set and I got to meet them both. She was lovely, friendly, and humble. I’m so glad she didn’t quit music. I’ve been coming back to this one. It’s haunting and just guts me. This EP, Caroline Spence’s “Spades and Roses,” and Jason Isbell and the 400 Unit’s “The Nashville Sound” are my favorite releases this year so far.